Bonnyrigg Rose assistant player/manager Jonny Stewart expects there to be an abundance of applicants for the vacant management post, but he has admitted he won’t be one of them as he isn’t yet ready to be a manager. 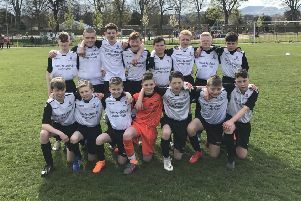 David White ended his 12-month spell in charge of the New Dundas Park club last Sunday, explaining he couldn’t give his full commitment to the role due to a hectic family and working life. Former Hearts player Stewart, still only 28, is already planning for life after playing having moved into coaching in recent years. He previously managed local amateur club Loanhead Parish and spent much of his eight-month rehabilitation from an ankle ligament injury helping out on the Rose training pitch last season. “I’m still fairly young and hopefully still have a few years left playing. I was assistant manager to Davie, so I’m enjoying that side of it as well – doing the coaching and I’m doing some of my badges at the moment as well. It’s definitely something I want to get involved in, I’m just not sure the right time is now. “When I go into management, I want to give it all to management rather than trying to play and things like that. I’m not sure if I would want to be a player manager. “I’m not sure what the club’s plans are yet, if they have anyone in mind or if they are going to open it up to applications. I spoke to him [Charlie Kirkwood, chairman] on Sunday and he just asked if I was happy to take charge of training this week. It’s not been the easiest of weeks for all at Bonnyrigg, with White’s decision to leave coming less than 24 hours after their surprise defeat at Highland League club Deveronvale in the first round of the William Hill Scottish Cup. Rose had hopes of another memorable run to match that of two seasons ago when they knocked out Championship Dumbarton before hosting holders Hibs at a packed Tynecastle. White’s decision came as a shock to Stewart and all of the players at the club. They will be determined to bounce back tomorrow when they visit Eyemouth United in East of Scotland Conference B action. Stewart continued: “I was sitting speaking to him on the bus on the way down from the game. We were gutted after the result, but I didn’t think for one minute he was thinking about resigning. When I spoke to him on Sunday morning he explained his reasons, and I totally understood. It’s obviously a big commitment and he has a young family. “The league is our main priority. It would’ve been great to go further in the Scottish Cup but our main priority is to win this league and get up to the Lowland as quick as possible. We are back to league business, and it’s another wee test for the boys to pick ourselves up and go again. “We’ve got quite an experienced changing room, it’s a great bunch of boys.